April | 2014 | DEBtastic Reads! Welcome to the Spotlight Mariko Nagai and Dust of Eden! 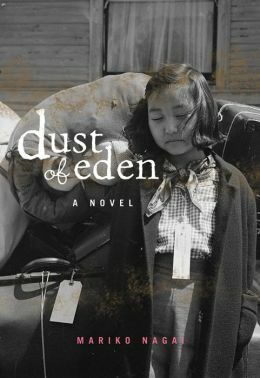 I’m absolutely thrilled to be shining the spotlight on Mariko Nagai and her debut middle grade novel in verse, Dust of Eden. I first met Mariko in 2006, I believe. I was living in Shanghai at the time and made a trip to Tokyo and met up with some wonderful SCBWI members in Japan. Stay tuned below for a chance to win a copy of this powerful book! After the bombing of Pearl Harbor, Mina Masako Tagawa and her family are forced to leave their home in Seattle and relocate to an internment camp in Idaho. This is the story of the Japanese-American internment during WWII. In poignant and powerful verse, Mariko Nagai tells the story through middle-schooler Mina. Mina who has to leave behind everything – including her cat and best friend. In the dusty barrack camps where the families are crammed together with no privacy and little amenities, Mina’s family cracks under the strain. Mina’s brother angry in camp, volunteers for the Japanese-American infantry to fight in the war. The beauty lies in the telling – Nagai’s verse is filled with emotion. Grandpa’s beloved roses survive in the harsh environment and serve as a reminder that under even the harshest conditions, beauty can be found. How did this book come about? Please share with us the journey of Dust of Eden, from idea to research to drafting to sale. The book story has been with me for a very long time – you can almost say that it’s a lifetime’s work. When I was eight, we moved to San Francisco, where there were many Japanese-Americans living there. That’s the first time I heard about “the camp” that Japanese-Americans had to live in during World War II. As I grew older, I learned different aspects of the Japanese-American experience, both good and bad. It was maybe in 2002 or 2003 when Mina, the protagonist, came to me fully, and she told me that she lived in Seattle and that she had two names – Mina and Masako – and sometimes she wasn’t sure which name was really her. It took several years to do research. The writing itself came rather quickly, but it took several years to revise, to sell it to the right publisher, and… well, it was a very long journey from idea to sale, but the journey was worth it. I am not a poet. I am in awe of you – poetry and novels in verse. What are some of the special challenges when it comes to telling a story in verse? I think one of the things I am still learning is how to write poems, which are like snapshots, while answering to the demand of the novelistic form – character development, action, etc. In many ways, in the perfect verse novel, you have poems that can stand on their own while having characters develop in a way that’s demanded by the novel form. You also have to answer to the demand of poetry – rhythm, forms, rhyming, etc . Often times, when verse novelists write, they are more focused on the structure and they sacrifice poetic elements for the sake of the novelistic form. It’s difficult, but there are wonderful poets who engage with verse-novels elegantly and wonderfully – Helen Frost, Margarita Engles, Marilyn Nelson, Nikki Grimes, Karen Hesse, etc. Mina has to deal with huge change, not only from her comfortable home in Seattle to the barracks in Idaho, but in the demeanor and behavior of her beloved family. The emotions come through so strongly in your verse – how did you get to know Mina? I’m not sure if I got to know Mina all that well – because poetic form demands that I focus on the moments, I could draw from my own experiences – anger, bewilderment, fear, hopelessness, love, closeness. As I wrote, the first draft took relatively a short time to write, but getting each emotion right in each poem, oh, that was a difficult part. Mina/Masako couldn’t articulate her feelings, and I had a hard time sorting it out in each poem. You were born in Japan, raised in the States and Belgium and now live in Tokyo. What do you love best about each place you’ve lived? I love each place! Each place is so rich with history and stories, it’s going to take me a lifetime to go through them! I love traveling, I love experiencing new places. There’s so many stories, so many places, I would love to explore! Mariko Nagai Bio: Born in Tokyo and raised in Europe and America, Mariko Nagai studied English/Creative Writing – Poetry at New York University. Her numerous honors include the Erich Maria Remarque Fellowship from New York University, fellowships from the Rockefeller Foundation Bellagio Center, Akademie Schloss Solitude, UNESCO-Aschberg Bursaries for the Arts, Yaddo, and Djerassi. She has received the Pushcart Prizes both in poetry and fiction. Nagai’s collection of poems,Histories of Bodies, won the Benjamin Saltman Prize from Red Hen Press, and her first collection of stories, Georgic: Stories won the 2009 G.S. Sharat Chandra Fiction Prize from BkMk Press. Her other books includeInstructions for the Living (Word Palace Press 2012), Dust of Eden (Albert Whitman & Co, 2014) and The Promised Land: A Novel (forthcoming Aqueous Press, 2016). She is an Associate Professor of creative writing and Japanese literature at Temple University, Japan Campus in Tokyo, where she is also the Director of Research and Study Abroad Academic Coordinator. She also serves as Assistant Regional Advisor of SCBWI Japan. For more about Mariko, check out her web site or follow her on Twitter. Want to win a copy of this outstanding novel in verse? (You do, you do!) Follow this directions to enter a drawing for your very own copy of Dust of Eden. 1. Comment on this post, and for fun, tell me your favorite place you’ve lived. I have good memories of every place I’ve lived. But if I had to pick a favorite, it would be a toss up between growing up in West Los Angeles (very good memories) and my current home here in CT. I am blissfully happy here. 2. Entrants must have a U.S. or Canada mailing address. 3. Comment by midnight EST on Friday, May 2. Winner will be drawn at random and notified by email. I’ll announce the winner here on the following Tuesday. Thank you to everyone who stopped by to help shine the spotlight on Emily Jiang and her debut picture book! I used a random number generator to choose the lucky winner of a copy of this fabulous book. The winner is…swtomp! Congratulations! Please email me at just kid ink at yahoo dot com (no spaces) with your mailing address and I’ll be sure to get the book in the mail ASAP! Thanks to everyone for playing! Stay tuned for more book buzz and more opportunities to win! Welcome to the Spotlight Emily Jiang and Summoning the Phoenix! 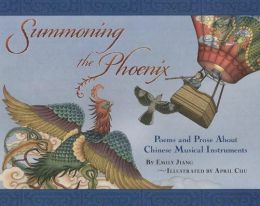 Congratulations to Emily Jiang and her debut children’s book, Summoning the Phoenix, now available for purchase! Stay tuned below for a chance to win a copy! Emily’s poetry about traditional Chinese instruments paired with April Chu’s lively illustrations will enchant readers young and not so young. For every poem about an instrument is a sidebar describing the instrument and the history, and sometimes a delightful folktale. The poems follow present-day students practicing on their instruments through preparing for and finally performing in a concert. So many fascinating instruments – I think my favorite, though, is the bamboo xiao which is said to be able to summon a phoenix if played beautifully. Tell me about the journey of your book – what was the inspiration, how many drafts did you write, and what was it like to get “The Call” (or email) that led to the publication of your book. “The Call” for Summoning the Phoenix was unexpected and unusual. Ironically, I came up with the idea for this picture book while researching the music-based magic system for my YA fantasy novel that is All-Asian-All-the-Time. I wanted to share the love of traditional Chinese music with future generations, so I pitched the idea to my first editor, Renee Ting, who, coincidentally, had always wanted to publish a picture book about Chinese music. The original concept was a purely nonfiction book featuring photos of Chinese musical instruments. Then I discovered a book called Chinese Music and Musical Instruments by Xi Qiang, photographed by Niu Jiandang, and translated by Qiu Maoru. Written in English and published in Shanghai, China, this book was exactly what my editor and I had originally envisioned. So we had to rethink our concept. We considered, perhaps, that our book should be illustrated instead, yet we were unsure how to restructure the nonfiction content in a fresh manner. “What’s your opinion about poetry?” I asked. A week or so later, my editor called me to tell me that she did not like Dark Emperor, she loved it! She gave me the green light to write poems along with prose about Chinese musical instruments. I wrote about six or seven revisions before she judged my manuscript as ready and gave me a contract. She was always available and open-minded to my ideas and even seriously considered my artist referrals, with my top pick being the amazingly talented April Chu, who eventually signed on as illustrator. When I could not decide on a title for my book, my editor was the one who came up with Summoning the Phoenix. While Summoning the Phoenix has a fantastic new publisher Lee & Low and wonderful new editor Louise May, I will always remember the huge contributions of my first editor Renee Ting. The words are all my own, yet she greatly influenced the shape the book from the beginning, and for that, I’m forever grateful. Do you play any instruments? Are you musical? What about music do you love? Thanks to my parents’ unwavering support of music education when I was a child, I can play the piano (10 years of classical training) and the guitar (6 months of classical training) and I’ve been singing in choirs and a cappella groups for over 20 years. I’m currently teaching myself how to play the xiao and the dizi, both Chinese bamboo flutes, which is a challenge because I’ve never played a wind instrument before, and the technique is completely different from piano or guitar. Music has always been easier for me than words. When learning a song, I always remember the melody before I can recall the lyrics. If I know the words to a song, that means I’ve listened to it at least ten times, while a melody can stick with me after hearing it only once. What I love most about music is that it IS a universal language that can transcend age and gender and culture. Even if you are deaf, you can still feel rhythm, an essential component of music. I’m revising a couple YA novels that are All-Asian-All-the-Time. But I also recently was ambushed by a picture book idea that won’t let go. As long as I’m writing, I’m happy. Would you like to win your own copy of this wonderful picture book? Follow the instructions below and enter for a chance to win! 1. Comment on this post and for fun, tell me what musical instrument you play or wish you could play. I took piano lessons (Suzuki method) for 13 years and sadly, have not kept it up. I also took lessons in guitar and accordion, and played the clarinet briefly in junior high. I would not say I’m musically talented! 2. You must have a U.S. mailing address. 3. Comment by midnight EST Friday, April 18th. The winner will be drawn at random and will be announced here on Tuesday, April 22nd. If you missed it, you can still read the interview here. What you don’t want to miss is this awesome and thrilling novel. 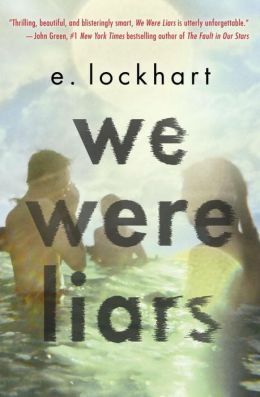 One lucky person, drawn at random from the comments wins an advance copy of We Were Liars! 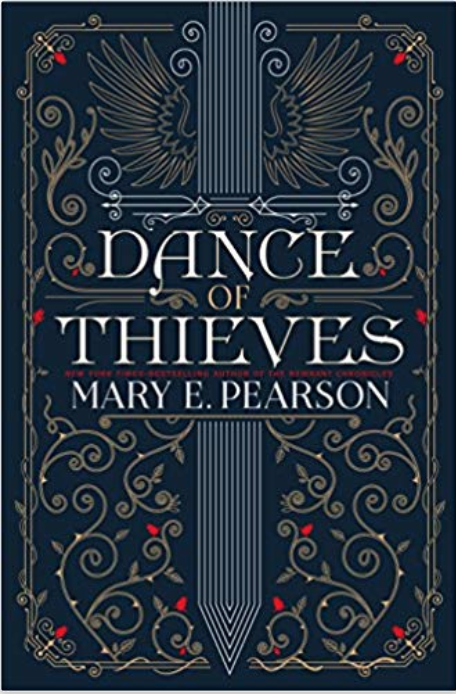 Thanks to Random House for providing this luscious prize! Ready to see who won? Using a random number generator, the lucky number is: 15! Who is that? Why, it’s Shaun! WooHOO! Congratulations! Please email me at just kid ink at yahoo dot com (no spaces) with your mailing address so I can forward it on to the publisher. Be sure to come back again for more book buzz and give-aways! Happy reading!